The green shutters are a very characteristic element of the architectonic landscape of Mallorca. 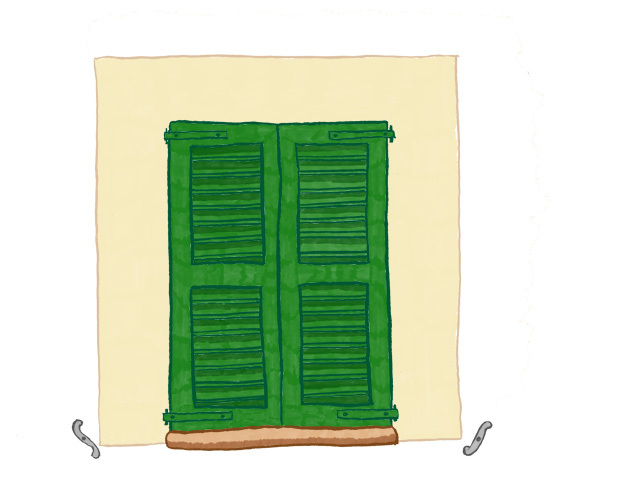 Just like if all the inhabitants of the island had made some sort of silent agreement, all the window shutters in Mallorca are the same style, colour and, most importantly, they are always shut. Neither in winter or summer you will see many open shutters; maybe we want a wee bit of shadow when we are just back from the beach, or maybe we just want to avoid prying eyes… The shutters protect us from the sun and they hide us, plus they let some nice air through their inclined slats. Majorcan shutter f; Shutter formed by either fixed or movable inclined, horizontal slats. However, just so we don’t get accused of thinking that we, the islanders, invented everything, we must say that the name that we use for them persiana comes from the French word persienne, which is how they would call a person from Persia, the current Iran. This is all due to the fact that in the old days, in France, the wood used to make shutters used to come from Persia. But why are they green in Mallorca? It is known that, towards the end of the XVII century, in one district of Palma situated in the area of the slingers (from sling https://en.wikipedia.org/wiki/Sling_(weapon)) – specifically between the streets Joan Alcover, Pérez Galdós and Foners – all the houses were refurbished. Maybe due to an excess of green paint or because of the criteria of a picturesque character that decided so, all the shutters in there were painted in green. So from then on, that cluster of refurbished houses started to be called the “district with the green shutters”, from which we assume that the green colour was a novelty and that the tradition began in that moment and it has been maintained and extended around all the island until our days. Actually, if you go for a walk around the slingers district these days, you will still find a school that keeps the name of Escola de Ses Finestres Verdes which means “The Green Shutters School”. Les persianes verdes són un element molt característic del paisatge arquitectònic de Mallorca. Com si tots els que habitem el territori mallorquí haguéssim fet un pacte silenciós, les persianes a l’illa són del mateix estil, del mateix color i, sobretot, estan SEMPRE tancades! Ni a l’hivern ni a l’estiu veureu molta persiana oberta; potser volem una mica d’ombreta quan tornem de la platja, o potser volem evitar mirades indiscretes… La persiana ens protegeix del sol i ens amaga, i, a través dels llistons inclinats deixa passar l’aire. persiana mallorquina f; eng: shutter f Persiana formada por lamas horizontales inclinadas, fijas o móviles. N’hi ha de tres tipus. 1.Persiana comú (amb els llistons rodons a les dues cares). 2.Persiana antiga (amb els llistons rectes per les dues cares). 3.Persiana combinada (llistó pla a l’exterior i llistó rodó a l’interior). Però, perquè no ens acusin d’illencs que es pensen que s’ho han inventat tot, cal dir que el nom de persiana prové del francès persienne, que vol dir persona de Pèrsia -l’actual Iran-. I tot això és perquè antigament, a França, la fusta amb la que es feien les persianes provenia de Pèrsia. Però, per què son verdes a Mallorca? Es coneix que, cap a finals del segle XVII, a un barri de Palma situat a la zona dels foners -exactament entre els carrers Joan Alcover, Pérez Galdos i Foners- van reformar totes les vivendes. Potser degut a un excedent de pintura verda, o per criteri d’algun personatge pintoresc que ho va decidir així, totes les persianes les pintaren de verd. A partir d’aquell moment, doncs, aquell conjunt de cases reformades es va començar a anomenar Barri de Ses Finestres Verdes; d’aquí deduïm que era novetat pintar de verd, que la tradició al barri va començar en aquell moment, i que s’ha anat mantenint, respectant i extenent per tota Sa Roqueta fins als nostres dies. De fet, si avui passegeu per l’antic barri dels foners, encara hi trobareu una escola que manté el nom d’Escola de Ses Finestres Verdes!